The English Course is an integrated lower intermediate English language course for students from false beginner to lower intermediate levels. 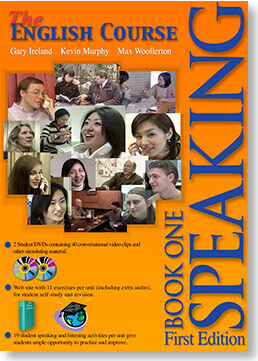 Speaking Book 1 is principally intended for young adult learners at college or university level. The aim of the course is to balance the communicative-based approach to language learning with cutting-edge technology, for both classroom use and student self-access study. The units in the textbook cover a variety of basic and useful functions. 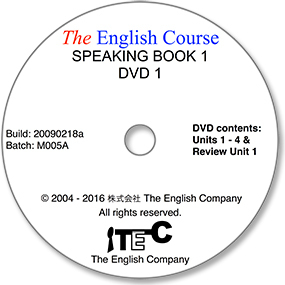 Each unit in the course includes the following: 4 video clips for listening comprehension, the demonstration of appropriate conversational settings and language use; 19 student speaking and listening opportunities; and 11 online revision/practice exercises on the student self-access web site, plus additional audio material for students to use. Elicitation of ideas based on a slideshow of images. Short video clip with listening and visual comprehension questions. Speaking practise with the target language from the video using an extract from the video script. Controlled speaking practise using a substitution drill with the extract from the script of the video. Presentation and practise to assist in recognising and understanding target language structures. Short video clip with somewhat more challenging listening and visual comprehension questions. Guided speaking practise using an alternative script on the same functional theme as the preceding video script. Role play on the same theme as the first half of the unit. Responding to various questions related to the theme and activities covered in the unit. Speaking practise with the target language using an extract of the script from the preceding video. A social, cultural or geographical quiz or survey to promote greater cultural or social awareness. Presentation and practise to assist in recognising and understanding target language structures on a related theme developed from the theme from the first half of the unit. Role play on the same theme as the second half of the unit. A light-hearted end-of-unit task using a video clip and the website. End-of-unit activities to consolidate skills and knowledge gained during the unit that can be completed inside or outside of the classroom. Click the picture of the book on the left to open and/or download a PDF file of Unit 2 from the textbook. Kevin Murphy first came to Japan in 1989 and has since taught at numerous universities and colleges in Tokyo and the UK. His main professional interests are pragmatics and curriculum development.